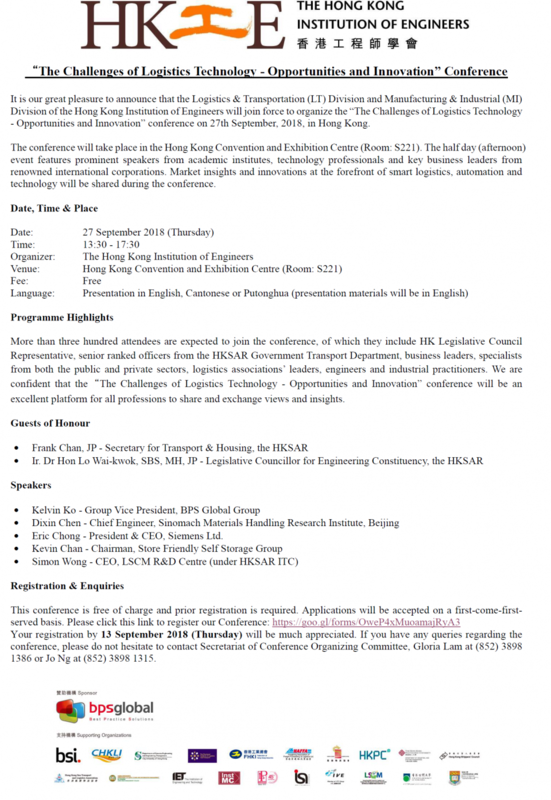 It is our pleasure to be one of the supporting organizations on the “The Challenges of Logistics Technology – Opportunities and Innovation” conference joinly organized by the Logistics & Transportation (LT) Division and Manufacturing & Industrial (MI) Division of the Hong Kong Institution of Engineers on 27th September 2018 in Hong Kong. The conference will take place in the Hong Kong Convention and Exhibition Centre (Room: S221). The half day (afternoon) event features prominent speakers from academic institutes, technology professionals and key business leaders from renowned international corporations. Market insights and innovations at the forefront of smart logistics, automation and technology will be shared during the conference. This conference is free of charge and prior registration is required. Applications will be accepted on a first-come-firstserved basis. For details and registration, please click the link HERE.